Last February, the dead body of a tiger was found in the forests near Gamatty, a village about 10 km from Mudumalai Tiger Reserve, Tamil Nadu, with a thin wire around its neck. Two weeks later three men from the Moundadan Chetty community were forcibly taken away from their homes inside the Mudumalai Tiger Reserve(MTR). Their elderly mothers were manhandled, but the neighbours came quickly to their aid and took them to the hospital. The villagers knew that the abductors were forest guards, but had no idea where to or why they were taken away. So they went on a strike blocking the main road in Gudalur, the nearest town, demanding the immediate release of the three men captured and kept in an undisclosed location. The officials from the Forest Department appeared and negotiated an end to the strike in exchange for their release. By then, the men were badly beaten and bruised and had been forced to sign a document taking responsibility for the death of the tiger. Tensions between the Moundadan Chetties and the forest department has been simmering for a few decades now. 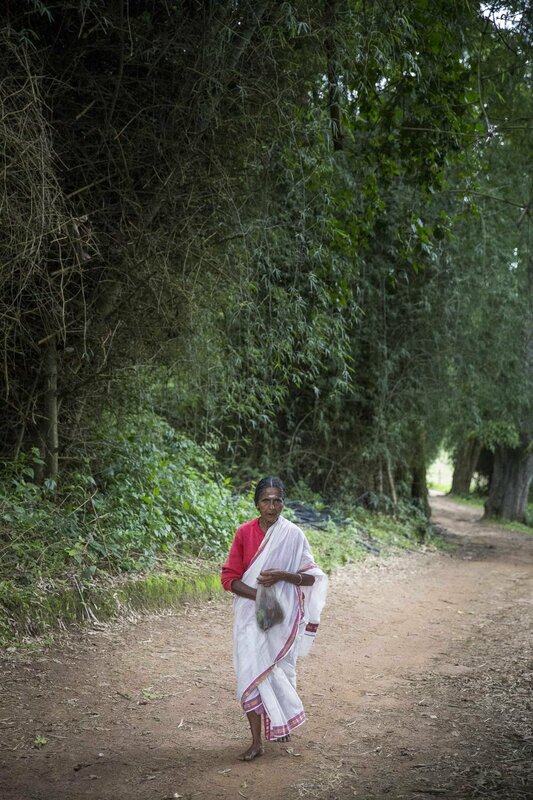 There are 701 Chetty families scattered in 7 villages (Mudugolli,Nagamppalli, Mandakarai, Puliyalam, Kappur, Pannamkkolli, Nambikunnu) inside the Mudumalai Tiger Reserve, which is under the jurisdiction of the Forest Department and in a village called Benne. The Chetties have been requesting relocation and rehabilitation for over 30years. But only 88 families have been relocated so far from MTR, despite a high court order in 2006 directing the Forest Department to carry out the relocation. Meanwhile, according to the villagers, the forest department’s grip over them tightened with every new law passed to protect wildlife. “They have the power to either control our lives or to set us free by relocating us out of this forest,” says A. A. Subramani, a local leader and relocation committee member at Mudumalai. 40yr old Subramani is a slightly built man with moderate ambitions. 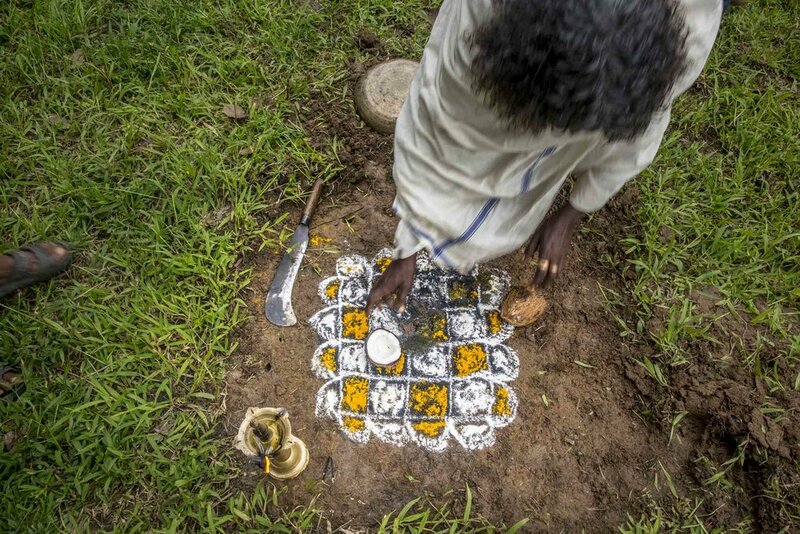 He lives with his wife,two children and his mother in a small house with a tiled roof in Nagamppalli. Facing his house is 1 acre of farmland and a beautiful mango tree at its crown. Traditionally, Moundadan Chetties are farmers. The villages of Mudumalai are essentially a valley connecting small mounds of forests on either side. In another era, this was perhaps a river bed. Subramani and his wife start and end their day on their farm, trying to make a living selling the vegetables and paddy they grow. Some of the Chetties had started to grow bananas. A risky business, considering they are easily destroyed in a storm and is a favourite food for the elephants. But if it survives, the returns are higher. Besides, people are getting more desperate as the odds stack against them. 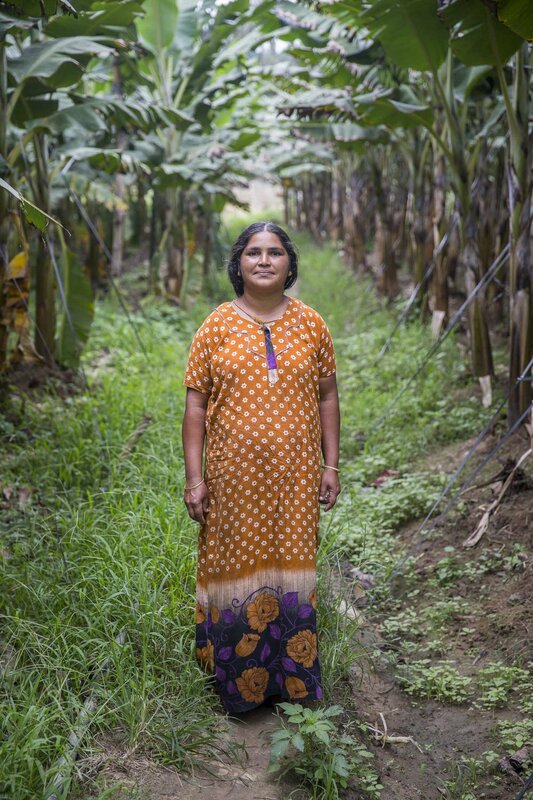 Subramani and his family grow pulses,pumpkin and ginger when it’s not the paddy season. Even then, the elephants come for the mangoes or the pumpkins. “Yesterday, a tusker had visited our farm”, Parvati, his wife, told us. The Chetties always know when an animal visits their farm. The animals often leave their footprints. But seldom attack their homes. Parvati seemed to have no anger in her voice, just a mild tone of acceptance, “We are surrounded by forests. This is home for the animals too,” she said. When the returns from the farm are not enough for the family, Parvati has to go out to work as a labourer in the wealthy estates outside of the Reserve to make ends meet. Throughout the day, Puppy, their pet dog stands guard in front of their house. Sometimes, the tigers or the leopards take away the dogs too. Subramani’s farm, like many others in the village, is legally owned and documented agricultural land, commonly referred to as ‘Patta land’ in this region. In the Nilgiris, Patta land is gold, because, a vast majority of people in the Nilgiris has land in their possession that is classified as Forest land or Assessed wasteland (belonging to the government/forest department) since 1969. This means that the legal ownership of those lands is disputed and the farming of such places (even if it has been in possession for decades) is considered an encroachment. Towards the end of 1978, with Karunanidhi’s Janmam Bhoomi Act, there was a major push for forest conservation and feudal systems were being removed. The farmers were given back the original legal ownership which was held back from them by powerful landlords until then. P. K. Govindhan (74), a village elder in Mudumalai remembers the time when the Tahsildar came to the village and required all the farmers to appear with their documents to register the Patta for their land. In the new India, there were to be no more feudal lords. India was going to champion her farmers. But in those days, news travelled very very slowly through these jungles, he said. “Some of us didn’t show up because there was work to do in our fields. Some of us couldn’t afford the registration fee. Some of us didn’t even know what was going on. But most of us did get Patta for our land.” Those of who didn’t manage to register would continue to cultivate their land for the next 40 years only to find out later, that they were not legally entitled to their farmland inside the Mudumalai. According to the high court ruling in their favour in 2006, the Tamil Nadu Government and the Forest Department were supposed to relocate the Moundadan Chetties from Mudumalai to Ayyankoli, providing them with houses, farmland with equal acreage and other basic facilities like water, electricity and roads. In 2008, when the nationwide Tiger Project came to fruition, the government needed the Chetties of Mudumalai to sign their acquiescence for the conversion of the then Mudumalai National Park to Mudumalai Tiger Reserve. “We were told that if we agree to the Tiger Project, our relocation process would be speeded up. So we all gave our signatures,” says Subramani. In the past 10 years since only 32 families have been relocated from Mudumalai. What happened instead was that the Forest Department gained autonomous control over the Tiger Reserve and by proxy, on the community reserve living inside it. Gudalur town in a jeep or car. A little longer, if you are travelling by public bus. This entrance in a village called Bos Bara is manned by Forest Guards. Private vehicles and tourists are prohibited entrance to the Tiger Reserve. There is no public transport into the villages inside either. A mud road connects all the 7 villages inside, each of which lies approximately 5km apart from each other. There are no schools (save a primary school up to 5th standard) or primary health care centres in Mudumalai. The nearest hospital is at least 25km away, and school close to 8km away. Oil, spices, clothes, stationery for the children, all need to be bought at the market in Gudalur. Govindhan remembers the time when the road belonged to the Panchayat. But they never managed to get permissions to tar the road or bring public buses inside. National Parks need to be protected, they were told. When M Karunanidhi first came into office in 1969, he promised electricity for everybody. But an elephant got electrocuted at the check post in Bos Bara. That was the end of the electric supply. That first electric post, however, still remains. When Jeeps - the only vehicle that seems tolerant of the mud roads, became available and popular in hilly regions in the 80s, the villagers brought it in as a means of transport. But the forest department levied an entry fee on the villagers every time they had to pass the gate. By 2007, after several strikes and negotiations, they managed to get permissions to bring their vehicles inside, mainly jeeps and a handful of motorbikes without having to pay a fee. Although, by then, the forest department had taken complete control of the roads. Those who could afford to take their motorbikes or the jeep to the world outside to go to school, to hospitals, to the market or to earn a living as a daily wage labourer. Others, have to walk along the mud paths, cutting through dense forests to reach the chained gate at Bos Bara to catch a bus ride to town. The guards at the gate are strict. Every Jeep that seeks to pass through the gate is stopped and checked. If the villagers have guests, coming through, they are subject to an interrogation by the forest guards, their names, phone numbers and addresses are written down and IDs checked. “This is for the safety and the best interest of the people,” Kaallan, a Forest Guard, from the Kattu Nayakan tribe, told us, “There are Maoist activities in these jungles,” he added. Kaallan is a decorated Forest Guard who caught a group of poachers in Mudumalai some years ago. He was honoured by the then President K R Narayanan and promoted from his post of a Forest Watcher to a Forest Guard. He was posted at the gate in Bos Bara a few months ago and the 8am-6pm curfew he imposed on the villagers, almost immediately precipitated into a fight. “The forest department know how to intimidate us. When a tense situation arises, they will immediately call the police. A bus full of police will arrive and we will be scared to silence, even when we are right,” says Subramani. No violence erupted from that incident. But the department agreed to relax the curfew for the residents. The Moundadan Chetty community is classified as MBC (Most Backward Class) – a unique categorization used in Tamil Nadu to identify communities who were one step short of being untouchable pre-independence. The Chetties are proud too. Until 1967, when they were given a chance to identify themselves as a scheduled tribe owing to their existence in the deep jungles for centuries, the elders rejected it. Claiming, that such classification implies that the Adivasis are socially on par with themselves. Thus, they had started out, with neither the advantage of the benefits of being a tribe in independent India nor with the forward mobility that communities living in towns enjoyed. This meant that they fell way behind in education, employment and healthcare. 32 yr old T V. Suresh is the son of TR Velayudhan, one of the first Panchayat Presidents in Mudumalai who recognized 40 years ago, that the only way his community could progress is if they lived outside of the forest.“This community was prosperous. Every house had plenty of rice and plenty of cattle. When the paddy cultivation is over, we would plant some vegetables in its place. What we didn’t have, we would barter with our neighbours. But this was before the forests outside started shrinking, animals started attacking our crops and cattle and our Gun licenses were revoked,” says Suresh. His father had installed the first private electricity poll in his village after the forest department refused to connect his village to the grid. The rest of the hamlets around him, however, continue to live off the grid. 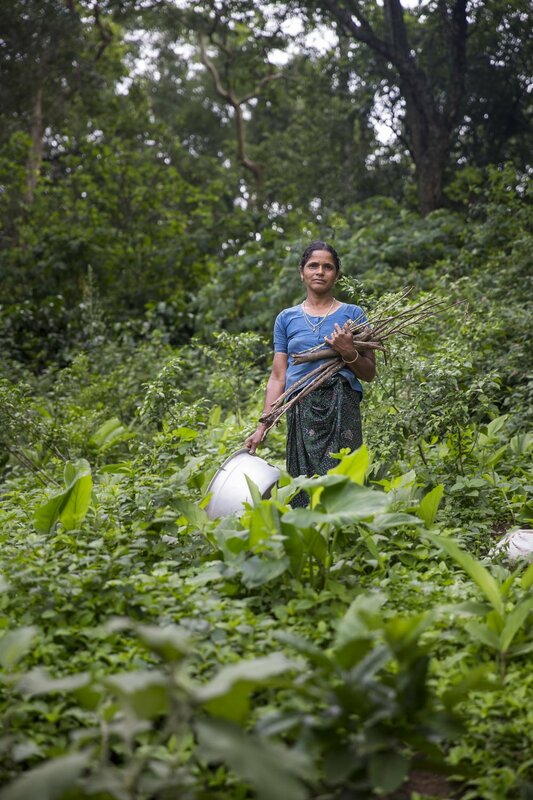 Unlike the Adivasis who also live in MTR, the Moundadan Chetties have traditionally been farmers. In the 18 th century, the region including the Nilgiris was part of the Kingdom ruled by the Mysore Maharaja. Eventually, 46000 acres of land came under the ownership of the Nilambur Kovilakam who were, at the time, accountants to the Mysore Maharaja. By 1885 the Nilambur Kovilakam had leased these blue mountains to the East India Company who looted its resources until the British made an exit from the country in 1947. All throughout history, the Moundadan Chetties had led a very peaceful, but docile existence. They paid their taxes, obeyed the rules and had kept their heads down. During the British rule, they were permitted to keep guns for their own safety. If there had been an animal attack, a British Shikari would hunt the animal down. The Chetties were also permitted to kill a wild animal found within the boundaries of their farm. All forest dwellers were allowed to cut ‘Kattumaram’ (a fast-growing native tree) and bamboo for construction purposes and were also allowed to graze their cattle in the forest lands. After the implementation of Forest(Conservation) Act in 1980, almost all of the privileges the Chetties enjoyed had disappeared. Their gun licenses were not renewed and when the licensee passed away, their family were asked to hand over the guns. Any attack on wildlife was illegal, wood cutting was not allowed, and a chain gate was installed at the entrance to the Park. the forests fearful of an elephant or tiger attack. As dusk arrives, Subramani’s family prepares for the evening. The weak solar lamps are switched on and there is a tape recorder singing in the background, powered by an old battery. Subashini is doing her homework inside while her mother Parvati is out on the farm pushing the bamboo fence back into the place where the elephant had broken it last night.Parvati had gone to work in the estates today. There were still un-plucked pumpkins in their farm. Why not pluck them? What if the elephant comes back? “I can’t take just a few numbers of pumpkins to the market. The trip to the market itself will cost more than the money I will make from selling these. The elephant may come back if it’s hungry. If not, we will cook one tomorrow,” she said with a smile.